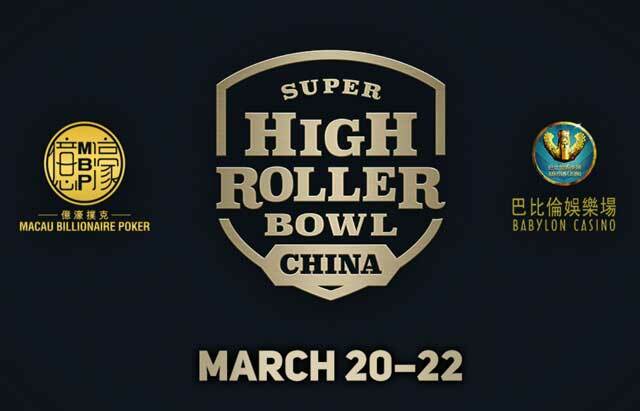 The Super High Roller Bowl expands to China on March 20-22. The Super High Roller Bowl is taking a trip overseas. PokerCentral, sponsor and creator of the Super High Roller Bowl, has teamed up with Macau Billionaire Poker, a poker room in Macau, to announce the expansion of the Super High Roller Bowl to China. From March 20-22 the inaugural, invite-only Super High Roller Bowl China tournament will take place at the Babylon Casino, at Macau Fisherman’s Wharf in Macau, China. Macau Billionaire Poker has attached a $100 million HKD ($12.8M USD) guarantee with a buy-in of $2,000,000 + $100,000 HKD ($268,000 USD) and unlimited re-entry for those selected to participate. In 2017 Macau Billionaire Poker hosted the MPB Summer Showdown Main Event, a tournament that boasted a $20 million HKD guarantee, the largest guaranteed prize pool ever for the area. The Super High Roller Bowl China is slated to break that record five times over. Surely poker fans will be eager to see what unfolds as well. Perhaps, more specifically, who shows up for the tournament. Macau has long been the location of legendary tales of ultra-high stakes poker games with some of the biggest names in poker, like Phil Ivey and Tom Dwan, seemingly swept up in the mystery of Macau. Perhaps the Super High Roller Bowl China will be an opportunity for fans to once again to watch Ivey, Dwan, and more, in action. The event is invite-only and currently is announced with a 49 player maximum, so it’s likely a carefully curated field of some of the elite players in the world matching wits against the richest business-minded poker players in Asia. For those looking to enter, an email address has been provided for potential registration information. Broadcast details of the event to be announced at a later date.